Born without the lower half of his left leg, Don Elgin never considered himself disabled until he was in high school - and even then, he had to be convinced. In the inspirational biography, One Foot On The Podium, Don candidly shares his story, of a boy from the bush who battled the odds and finally stepped onto the podium as a medallist at the Sydney Paralympics. Driven by an inherited sense of grit, determination and pure guts, Don overcomes an abundance of obstacles to rise to the top of the sporting heap. His life's philosophy tells us that success is not a birthright - it's earned. One Foot On The Podium is not just the rags-to-riches story of a poor disabled boy who becomes an elite athlete. It's a tell-all tale laced with his natural humour and just enough larrikinism to make him loveable. The way Don tells his story is the reason he's one of the most entertaining and engaging speakers on the Australian circuit today. Don Elgin was raised in the NSW town of Tocumwal. Being born without the lower portion of his left leg was no barrier for this boy who would make his first Australian team at 18 years of age. Don went to the 1994 IPC World Athletic Championships in Berlin, where he won a gold medal as part of the 4x100m relay team. Following this event Don's focus moved from the sprint events to the Pentathlon – five events: long jump, shot put, 100m, discus and 400m. Competing in the Sydney 2000 Paralympic Games he won bronze in the Pentathlon. Don won a Silver medal at the 2002 IPC World Athletic Championships. In 2004 Don became a triple Paralympic medalist the Athens Paralympic Games. A business leader Don established StarAmp Global, a boutique management company managing only amputees the first of it's kind in the world. Don's desire to help others saw him become team manager for the Australian Paralympic Athletics Team in London 2012. Away from sport Don is an in demand motivational speaker, he is a proud husband & father, his three daughters and his son are his inspiration to continue to get the get the most out of life. Question: What inspired you to write One Foot On The Podium? Don Elgin: The inspiration for One Foot On The Podium has come from the many people who have spoken to me following my presentation they have attended, many would ask if I have a book as they would like to learn more about my life and share my story with their kids and other people that were not at the function. People are interested in what it was like for me growing up, not only for me but what my parents went through and how they coped. It wasn't until after I had written One Foot On The Podium that I realised how much people were able to take from my life particularly the importance of getting back up and having another go when we fall. Question: Was it difficult at all to relive your younger years? Don Elgin: I wouldn't say it was difficult to relive my younger years when I was writing One Foot On The Podium as it is something I often do when I am presenting to different organisations, what was a little difficult was hearing what my parents went through in the early days of my life and knowing what they went through because of me. There were a few dark days for me as a young fella and having to reflect on those was at times a little sad, though the absolute best thing about writing One Foot On The Podium was the opportunity to reflect on the many fun things and slightly crazy adventures I got up to with my brother, sisters and mates. Question: What do you hope Australians take from One Foot On The Podium? Don Elgin: I certainly hope One Foot On The Podium is not limited to only Australians, having presented around the world I hope whoever reads my book, wherever they are around our amazing planet I hope they are able to take a break from their own lives and enjoy an easy read as I walk people through the ups and downs of my often exciting and sometimes scary life. I also hope they are able to get a feel for how things were in country Victoria in the late 70's with a family that had very little and then to enjoy the adventures of up growing up in the NSW riverside town of Tocumwal with hopes of one day representing my country at the highest level. I would love for people to finish my book and feel excited to go to a book shop and buy One Foot On The Podium for a friend. Question: How did it feel to be a medallist at the Sydney Paralympics? Don Elgin: There are some events in life difficult to find adequate words to do them justice, winning a medal in a home games at the Sydney Paralympics is certainly in that category. The years of hard work and choices made along the way all funneled into that one day, that one chance to get it right, to be present and absolutely at the top of your game, being as physically and mentally prepared as humanly possible and knowing you are not only pushing yourself to the limit but you are surrounded by the worlds best athletes doing exactly the same thing, aspiring to be the best in the world. This is what makes it so exciting to achieve that goal of being a medalist. That feeling of accomplishment is also an amazing relief and vindication for all the people that stuck by you and never gave up or let you give up on your goal. Question: Why did you believe it was important to include your natural humour in One Foot On The Podium? 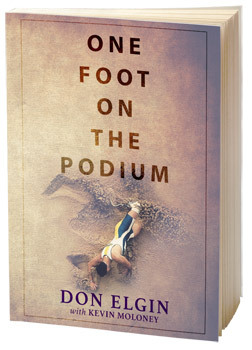 Don Elgin: One Foot On The Podium is the story of my life, my life has been filled with entertaining moments and it would be remiss of me not to include them in the telling of my story. I have a strong belief those with the ability to have a laugh and more importantly laugh at themselves will enjoy life more so it was a no brainer to include humour in my story, there is a great delight in being able to share true stories that are humorous and feeling comfortable at people having a laugh with me.